A Franco-Dutch international collaboration involving researchers from the laboratories of Condensed Matter Physics and Hydrodynamics at Paris-Saclay University and the Van't Hoff Institute for Molecular Sciences at the University of Amsterdam has resulted in a new method for very precise determination of fluid flow in capillary networks in realtime. Their proof-of-principle is published in this week's edition of Nature Nanotechnology. In their Nature Nanotechnology paper, the French-Dutch research team now reports the use of nanorods rather than spheres. They show that instant detection of the collective orientation of the nanorods in a small focal volume enables the direct measurement and fast scanning of the local shear rate. 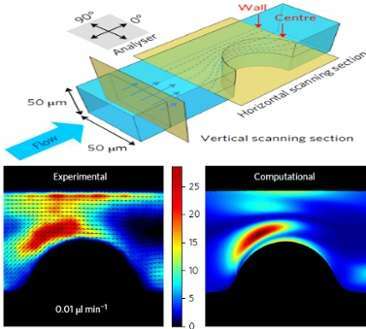 As a proof of concept they demonstrate tomographic mapping of the shear distribution in a microfluidic model system using scanning confocal microscopy.